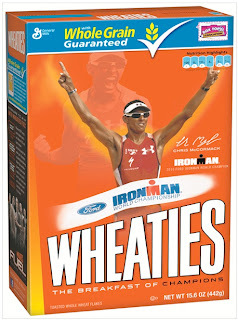 This is the new Wheaties cereal box in honor of Chris McCormack, the 2010 Ford Ironman World Champion. He raced 140.6 miles to beat out 1800 other multi-sport athletes recently in Kona, Hawaii, in a time of 08:10:37. 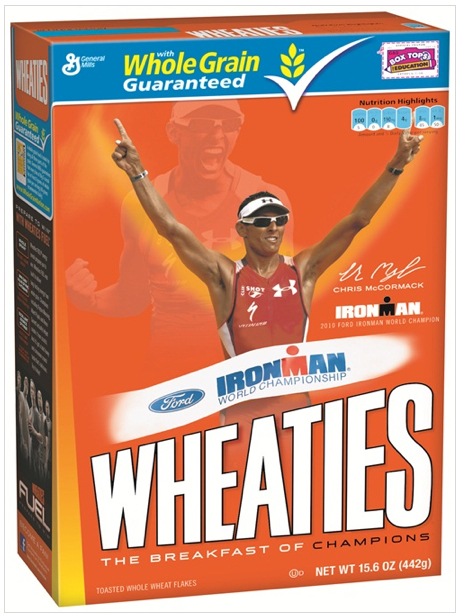 He is the first triathlete to ever be honored with a spot on the front of a Wheaties box. If he inspires any child to get out their front door and swim, bike, or run, it will be a very wonderful thing. McCormack is just plain inspirational, and fast. Chris McCormack's Wheaties Box Reveled - in markets in March 2011. NBC coverage of Kona Ironman is on TV Sunday afternoon!